It’s Always Springtime in Austin. With the mild weather we have during the fall, winter and spring months in Austin, we never really have much of a chance to get a break from seasonal allergies. The grasses, flowers and trees seem to always be blooming, and many of us suffer from sneezing, sinus pressure and terrible headaches. Don’t you want to come and visit? I used to suffer from crazy allergy symptoms. I was simply beautiful to look at and talk to when everything was in full bloom. I’m kidding. In actuality, I thought there was not enough Kleenex in the world to make me tolerable to be around. But then, two things happened that sort of changed things for me. The first is that I had Emma. I literally have zero idea as to why my allergy symptoms got remarkably better after I gave birth to my second child, but they did. I only have anecdotal evidence to support this, but I think Emma must have had magic powers or something. To make my own blend, I bought a roller bottle and put 20 drops each of Lemon, Lavender and Peppermint in it. If I use it on my kids, I put some coconut oil on them before I apply the oil so that the Peppermint doesn’t feel too hot. I like to use empty essential oil bottles with a Young Living roller cap for my roller bottles, but here are some good looking ones with metal rollers on Amazon if you don’t have empty bottles (Amazon affiliate). I’m not the only one who loves LLP. My new friend Spudly is a big fan, too! I choose use Young Living oils because of the Seed to Seal promise. These products are genuine and without synthetics. The company carefully monitors every aspect of essential oil production – literally from the each plant seed to each bottle’s seal – so that it can produce essential oils with unmatched purity. I feel confident using them for myself and my family. There are absolutely other oils on the market, including some that you can buy for much cheaper. However, from what I’ve found doing my own research, Young Living essential oils are the only that I personally feel comfortable using. If you would like more information on Young Living essential oils and how they can help your family with their wellness goals (and ease seasonal allergies! ), please reach out to me at Lindsay@MakelyHome.com. I’m always happy to answer questions. Or if you are ready to get started using Young Living essential oils in your home, you can sign up here. Here’s to having fewer seasonal allergy symptoms! With Summer just around the corner, many families are planning trips to the Disney Parks. The last time I was at Walt Disney World, I noticed what a big deal pin trading is now. Many kids (and adults!) had lanyards holding Disney themed pins around their necks, and they were trading them with Disney employees and fellow park goers. Although my kids haven’t been to Disney when they were old enough to pin trade, they do participate in a lot of pin trading through Destination Imagination. At both the State and Global tournaments, there are hoards of kids gathered around trading pins and working on their negotiation skills. We just got back from the Texas tournament yesterday, and Zack brought home a huge amount of pins to add to his Destination Imagination pin collection. As I was adding them into the book I made for him, I decided to show you the DIY Pin Trading Book I made for him last year, because it is working really well! 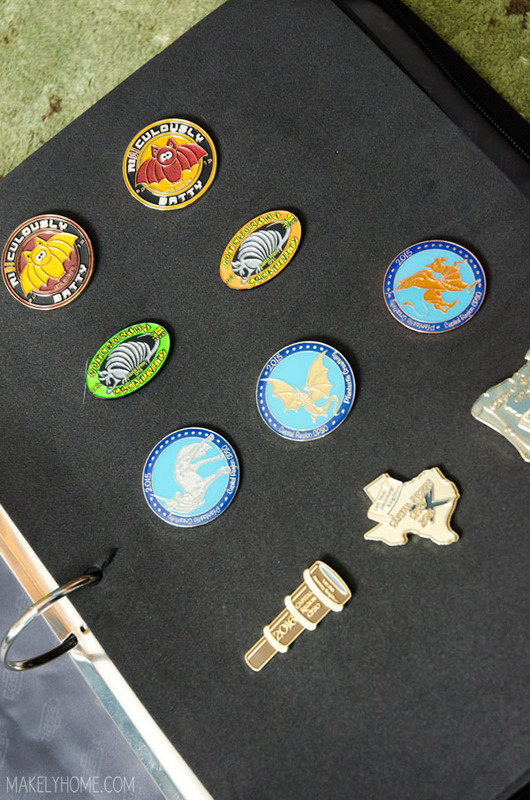 You can buy pin trading books at our DI tournaments (and at Disney! ), but I wanted to make my own that had some special features – and it was cheaper than purchasing one sold just for pin trading. I bought a few things on Amazon to get started. 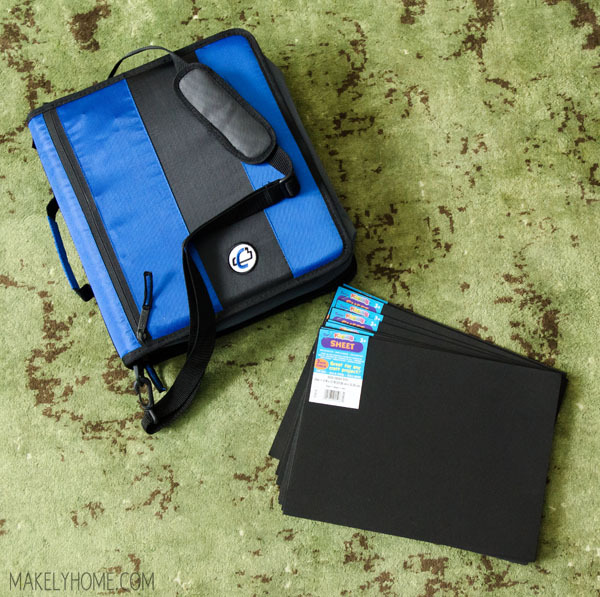 The first thing I got was a zippered 3-ring binder that has a shoulder strap. It was important to me that Zack could carry around his pins on his own, and I wanted it to be zippered so that he wouldn’t lose pins when he was running around. The binder I bought him also has a zippered pocket on the front, which I wanted, too. This is the link to the exact binder I bought for him (Amazon affiliate link), but you may want to search some more on Amazon since there may be some different options now. This one was $17.99. I also bought a few bulk sets of 9×12 black 2mm Foamies sheets. I’ve seen people use felt for page inserts, but they felt too flimsy for me. The Foamies sheets have some thickness to them, so they don’t feel like they are flopping around. I bought 2 packages of 10 sheets on Amazon (affiliate link), but again, check prices before you order. They were $6.41 a package when I ordered. 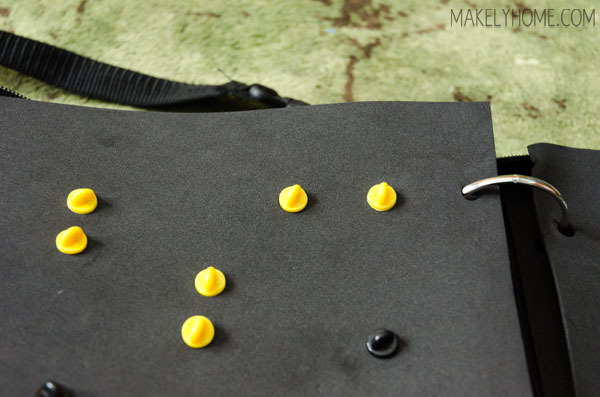 With my three-hole punch, I punched holes in the Foamies pages and inserted them into the binder. Depending on the size of the pins, we do anywhere from 6-10 pins on a page so that they don’t get too heavy and rip. I like to keep his pins organized by type so that he can have a better idea of what he has. For example, these pins are from Regional tournaments that he has participated in. I also ordered some rubber backs for the pins in his collection. Many of them had metal butterfly backs, but I was worried that they would scratch up the surface of the pins underneath them. It’s also always good to have extra backs on hand because your kids will probably lose some! He keeps extras in the zipper pocket on the front of his binder. I bought a package of 50 rubber pin backs on Amazon (affiliate link) for $5.99. We’ve actually gone through all of them, so I need to order some more. 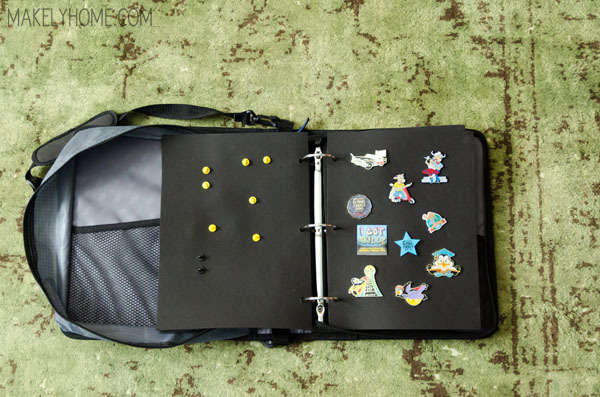 We have now used all 20 pages of Foamies in his pin trading book, and they are so neat and organized! He loves looking through them, and I love that they aren’t all over the floor of his closet. Do you or your kids have any trading pins? How to your store them and carry them around?